You know how when you go to the dollar store and you find something cute but don’t do anything with it right away and wind up packing it up and not using it? 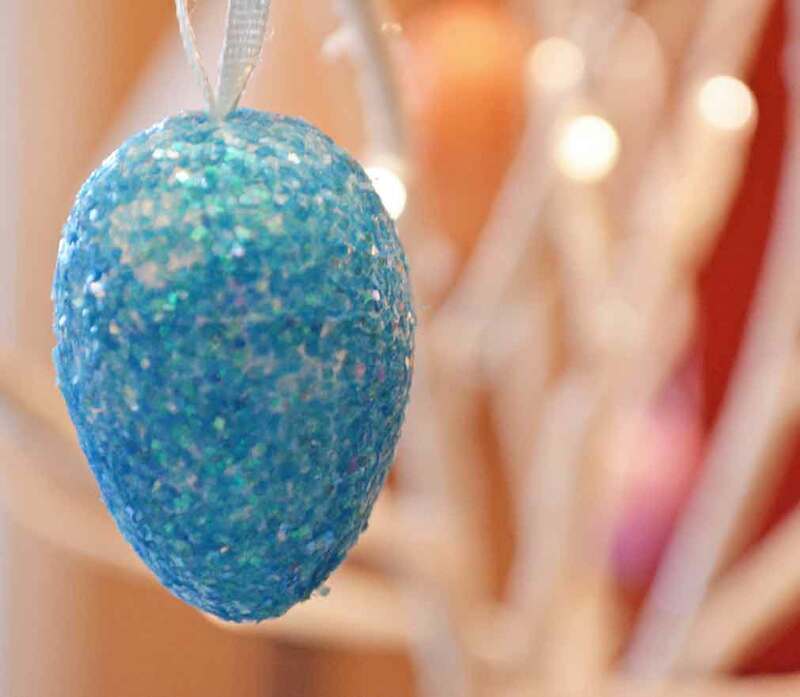 At any rate, when I opened my Easter craft stash I saw some cute little glittered eggs with ribbon loops. 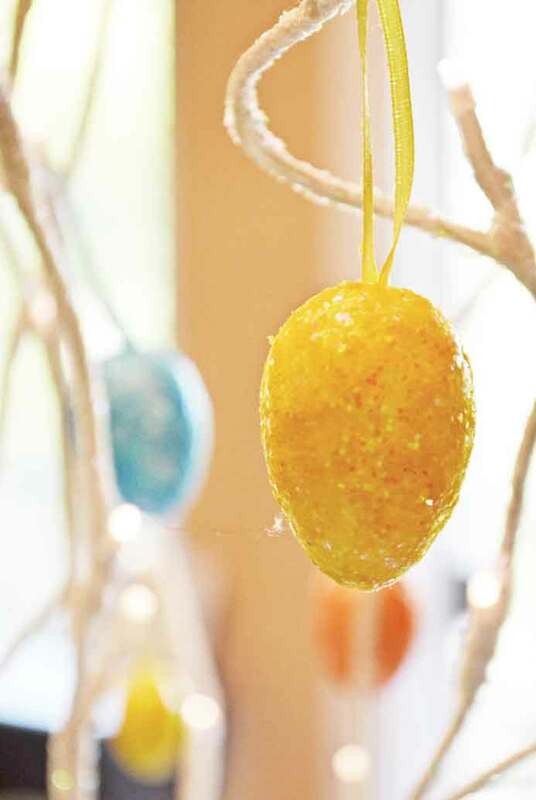 Perfect for an Easter tree. 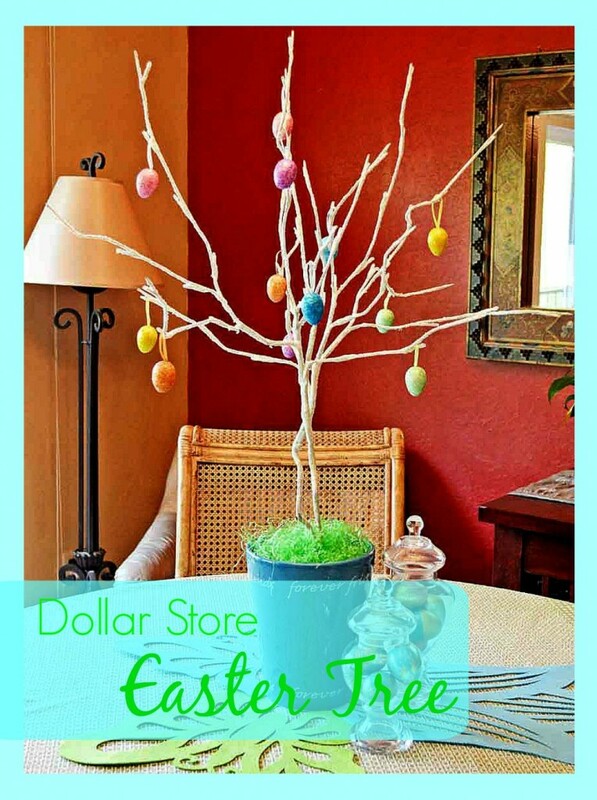 Which is actually pretty ironic because when I worked at the craft store they were forever bugging me to make Easter trees and I never did. Ha! After all of these years, I finally got a decent start on one and wanted to show it to you. 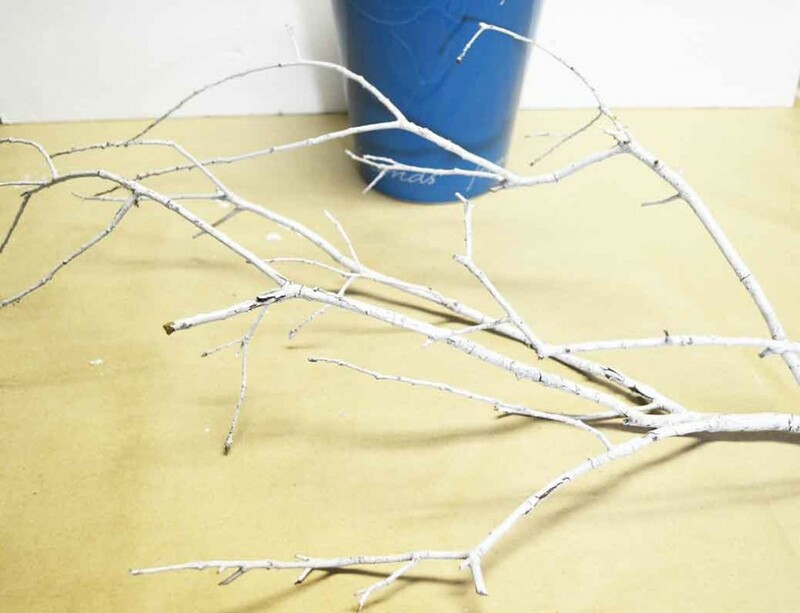 I used some wired branches I bought for Christmas but you could certainly grab some branches from your yard and spray paint them white, if you want. 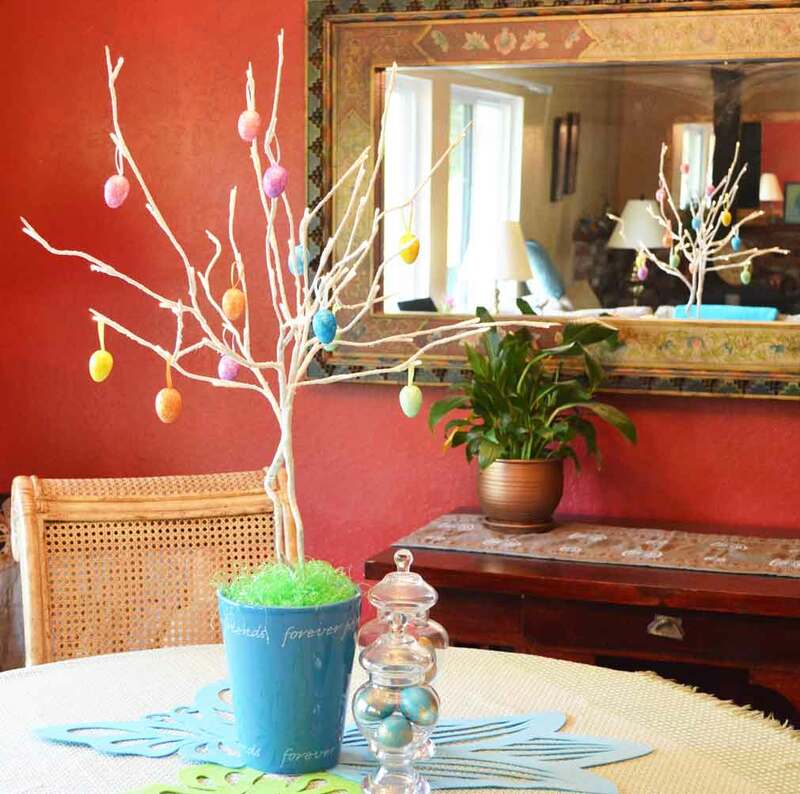 In either case you’ll want to pick a vase or pot that is the right dimension for your branches. Mine are pretty tall so I used a larger vase. 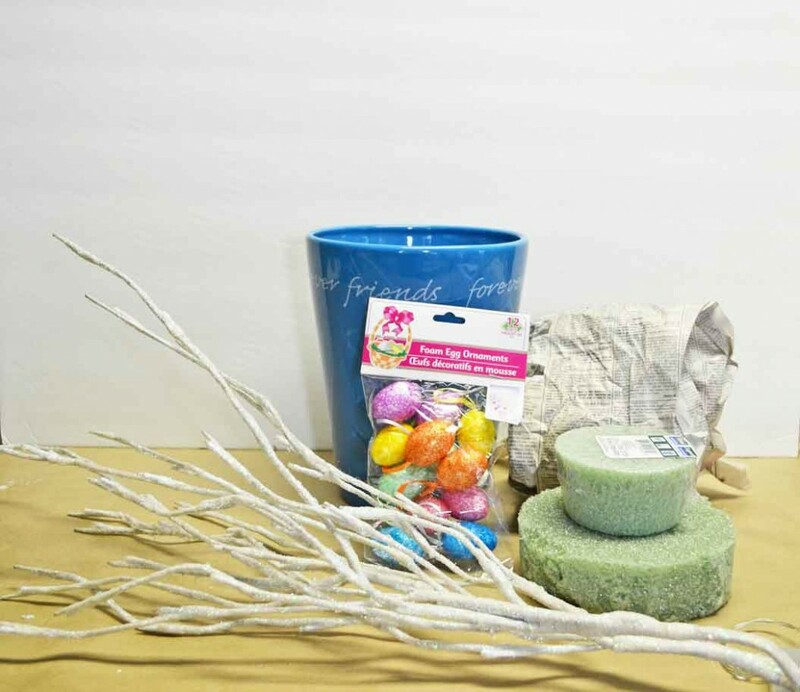 The ‘trees’ I’ve seen in craft stores aren’t as large though so a smaller clay pot would work great. 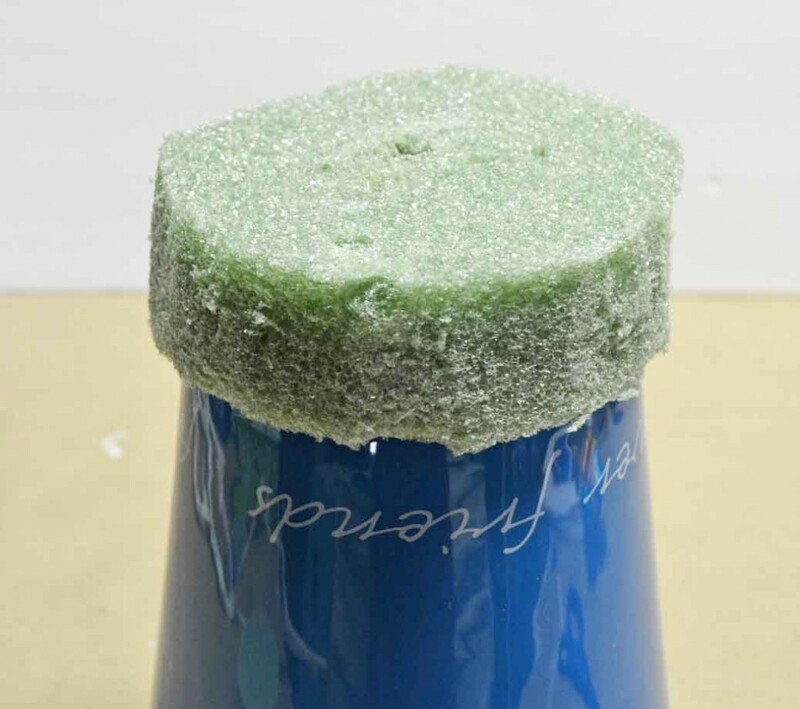 To measure the foam for the bottom of the container, I turn it upside down, place the foam on the bottom and press until there’s an indention on foam. Then I take a serrated knife and cut the excess off. 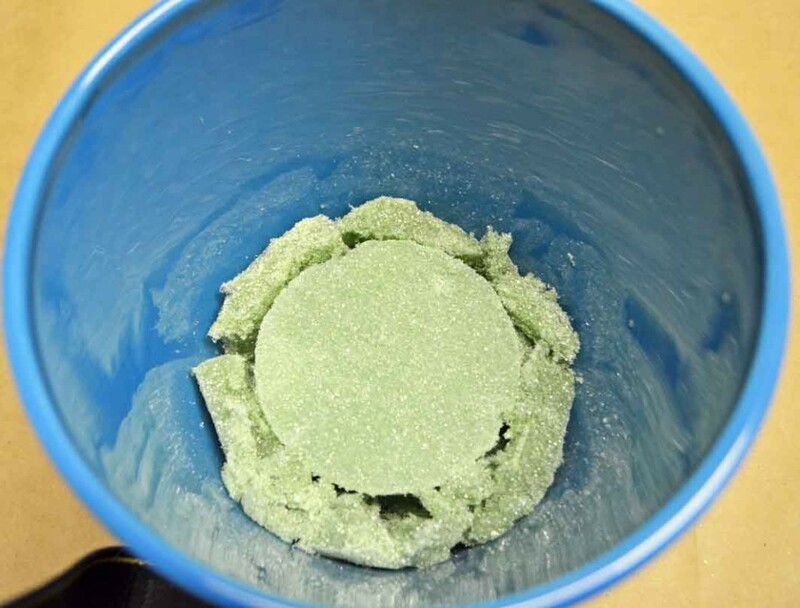 You can hot glue the foam to the container or use florist adhesive, but I prefer just to wedge the foam in since this is a temporary thing. I used two round ‘bricks’ of foam for more height because my branches are so tall. The scrap pieces are from the bottom part that I cut to size then wedged them around the top brick. Then stick your branch – or in my case, branches – into the foam. 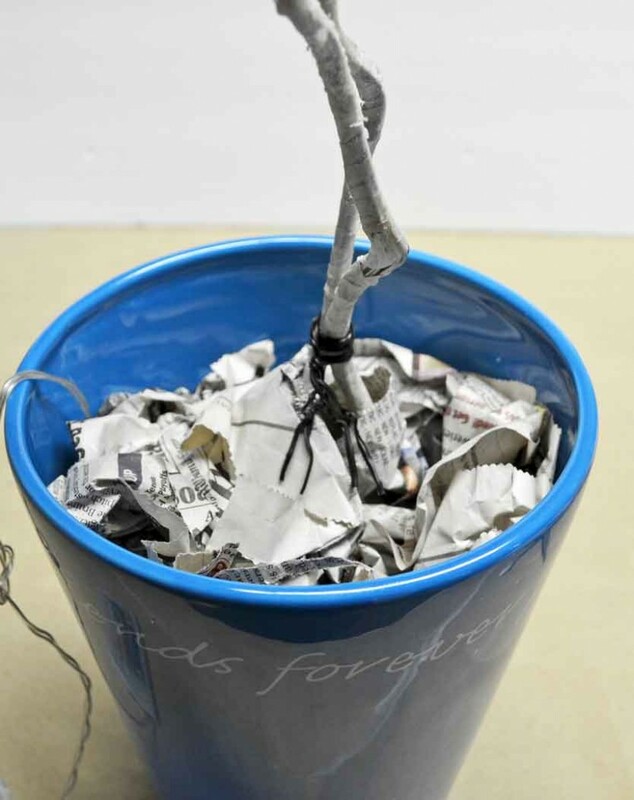 I wrapped a twisty-tie around the stems to hold them in place then packed the vase with newspaper. It’d be more secure if you filled the vase or pot with Styrofoam but in a pinch newspaper will work too. 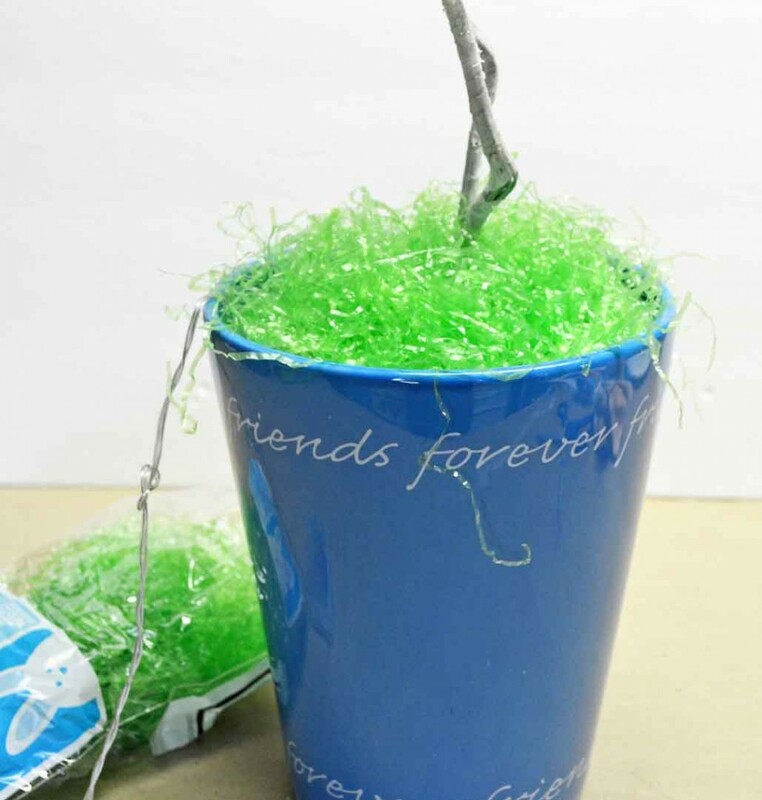 Then top off the container with Easter grass . . . from the dollar store too. In case you’re wondering what the cord is, the white branches have tiny battery-operated lights on the twigs. Then just hang your ornaments! I want to get some more ornaments. Or maybe make something a little different. I’m not sure yet. There are plenty of blank branches though. Maybe I’ll see if I have any Easter colored ribbon and tie little bows, I dunno. I love how the tree reflects in the mirror too! I tried to take a photo in the dark with the little lights but it didn’t turn out. Oh well. I want to make a Spring table runner but in the meantime I threw down some felt butterflies and a tulip from the dollar store. 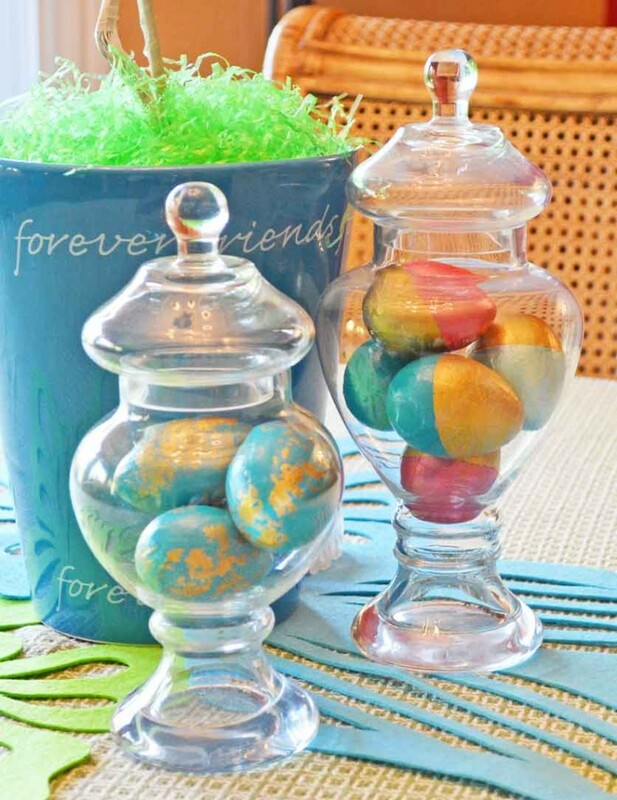 And I put my Faux Gilded Eggs and Dip Dyed Eggs in my thrift store apothecary jars. So simple and I always love decorating with dollar store stuff. I’ll also mention that this is a huge milestone for me . . . having the dining room table somewhat decorated. 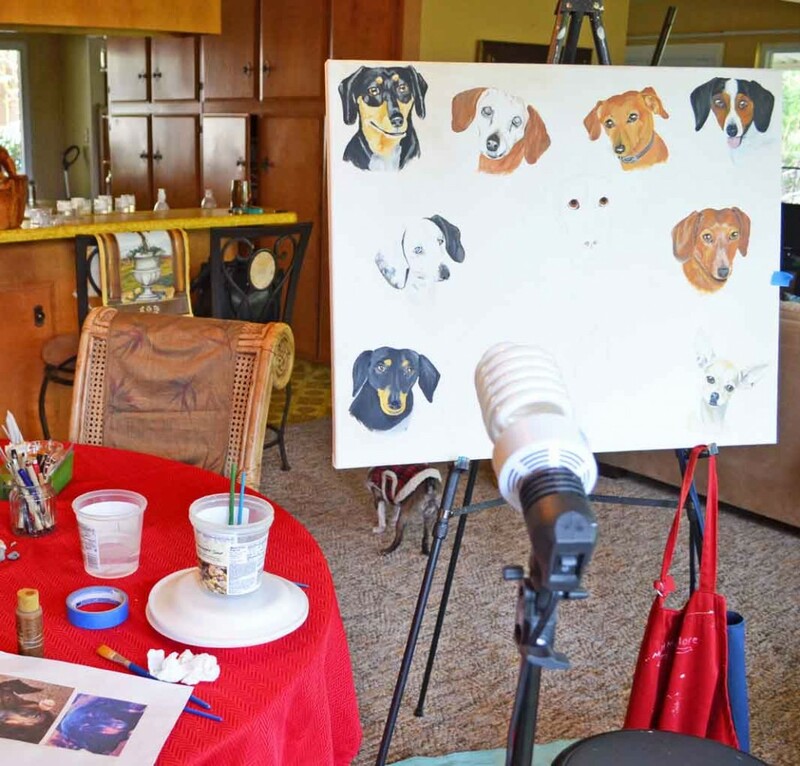 Ever since Mom died last October it’s been hard for me to work downstairs in my studio. I’m not exactly sure why. It just felt so lonely down there for some reason. 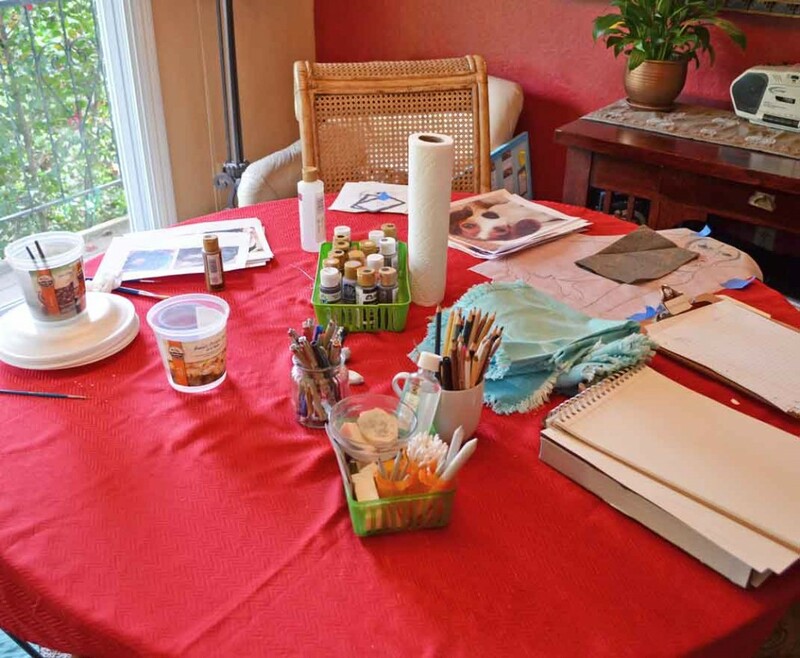 So the dining table has been a hot mess for a few months. Complete with a red tablecloth left over from Christmas. Christmas?! I decorated for Christmas, two months after Mom died, but haven’t done much since??? I told myself it was because of the awesome natural light but, truth be told, I only have one TV hooked up and it’s in the living room so that’s where I’ve been hunkered down for the most part. Until last weekend. I cleared off the dining room, took all my work stuff downstairs into my studio, started to paint and ran across the easter egg ornaments. So I lost my way for a little while. So what?! It makes finding my direction all the more sweet when it happens. 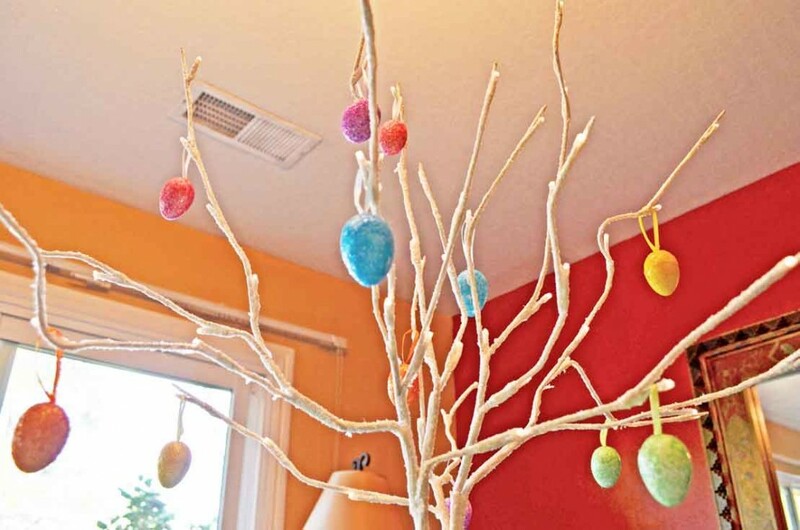 I just might make some extra Easter tree decorations after all. 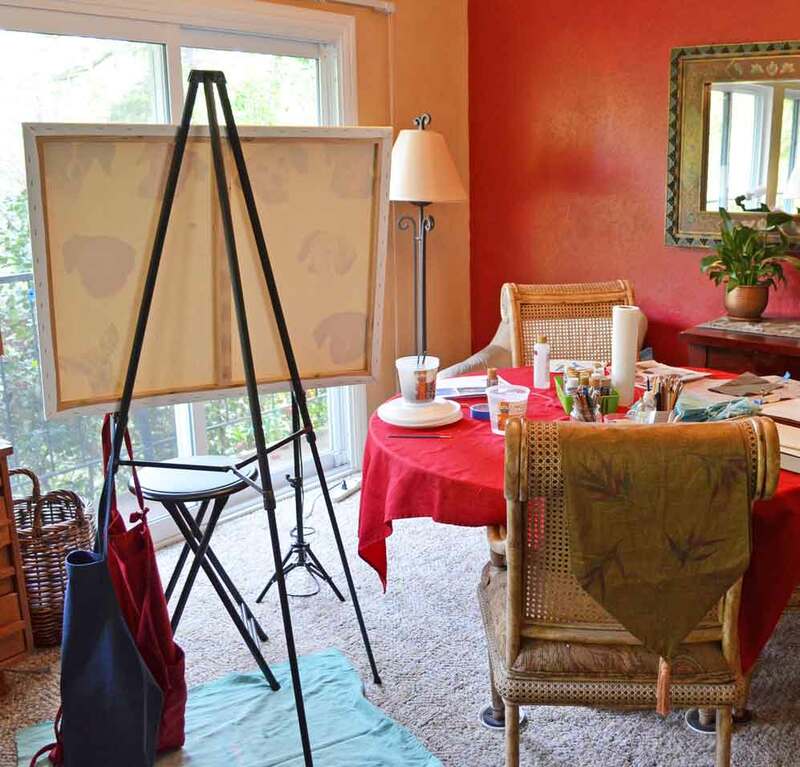 I love seeing my portrait in the works! I really like your tree. Great idea. I just may make one this year too. 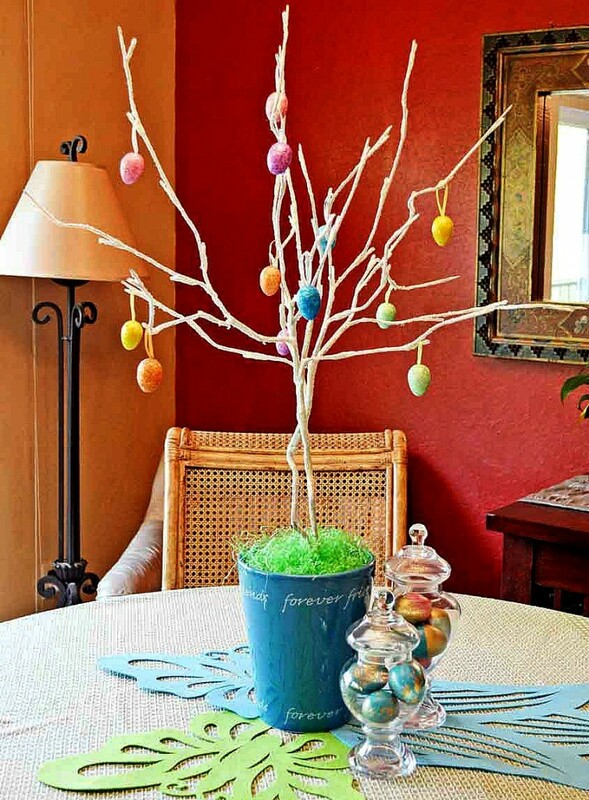 What a great idea: to build an easter tree! How have I never thought of this before? The kids would love to do it, they go crazy each year with the christmas tree. Thank you for the idea!